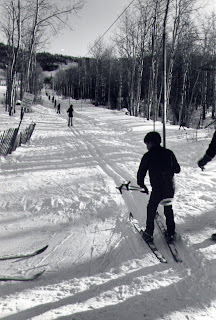 The Mesa Creek Ski Area saw several improvements as skiing grew. A Poma Lift, funded by the Lions Club and the community, replaced one of the rope tows. This same lift, known as “Lion’s Lift,” was later moved and used at Powderhorn Resort until 2005. More terrain was opened at Mesa Creek and the management group became known as Grand Mesa Winter Sports, Inc. At that time, family season passes were $95. The first ski school in the area was started in 1952 by Don Larsh, a member of the 1948 US Olympic Ski Team. The area became more and more popular and it was soon apparent that a different location was necessary. The US Forest Service recommended development of the Big Beaver Creek Basin but funds for the move and expansion were very limited. A group of private individuals got together and formed the Colorado Grand Mesa Ski Corporation which began the process of building a new ski area.